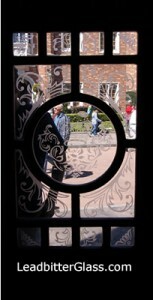 Etched glass photos of windows and doors from around the world. 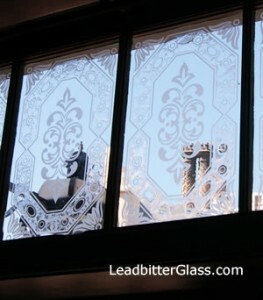 The Leadbitter decorative glass studio did not create these actual jobs but these images may help you choose your perfect pattern or style. 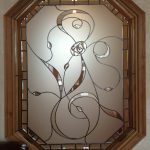 We can use these patterns and styles to create windows and doors in your exact glass sizes. Be inspired by examples of other works…. 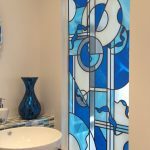 This beautiful etched glass spiral design with Italian Fused glass tiles is the type of glass design that is becoming very popular over recent years. 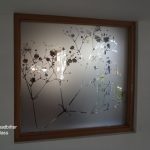 The Leadbitter Glass Studio has created many glass designs similar to this for clients all over the UK. 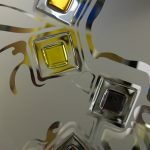 This Art feature window was photographed by us on show in a reception area at a large Manchester company headquarters. These images were taken at the Walt Disney World Resort Epcot theme park in Florida at the Rose & Crown pub. 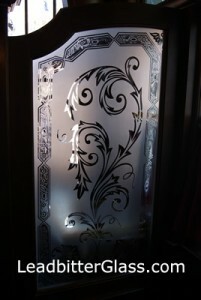 These traditional sandblasted glass panels were created for the internal glass features and the front door of the pub. 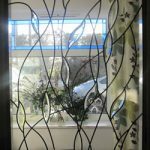 We can create glass designs similar to these patterns on shaped glass, single glazed glass or even double/triple glazed glass units. 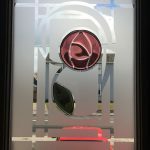 Etched glass pub names and other text is a great idea for licensed premises and other commercial buildings and we can supply designs featuring wording of your choice in any font and size that you require. 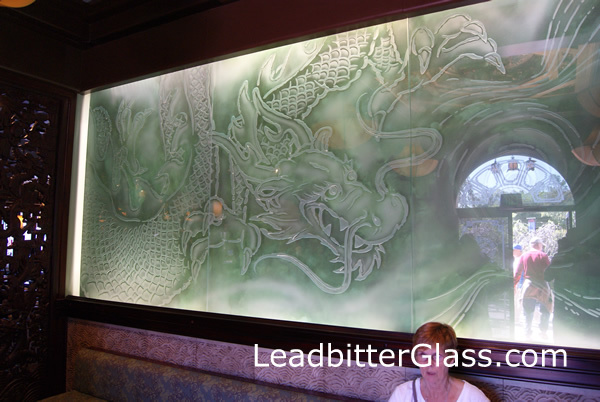 This large glass wall feature was created for a Chinese restaurant and the wall behind the glass was painted green first. 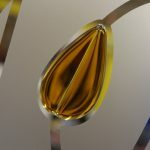 The glass is deep carved or ‘deep sandblasted glass’ as it is also known. The deep blasting gives it that 3D effect to the design and the whole feature measures more than 3 metres in length. 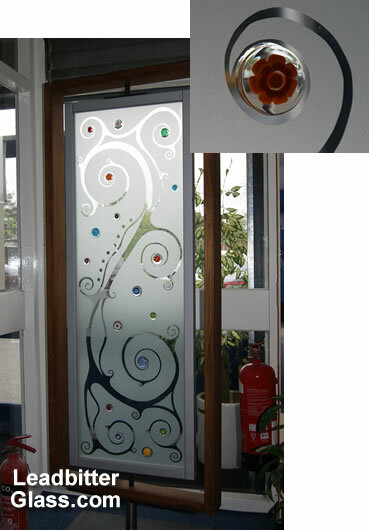 To create this type of sandblasted design, thick glass of at least 8mm would need to be used. 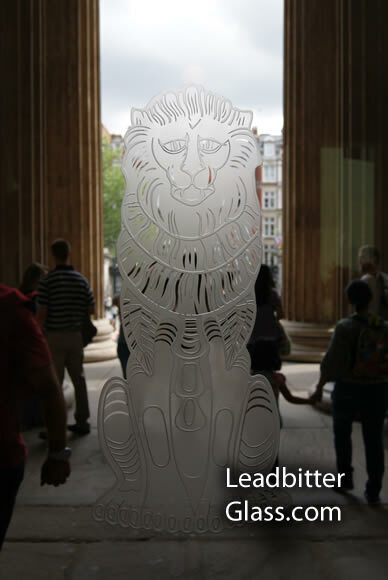 This Etched Glass Lion design is carved into the main doors of the British Museum on Great Russell Street in central London. The 3D effect has been created by ‘deep sandblasting’ most of the lines in the design and then a light sandblast grit has been sprayed around the majority of the remaining design to give it the etched finish. 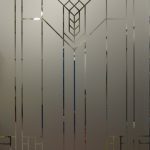 Leadbitter Glass can create this style of sandblasting for many different design styles and company logos. 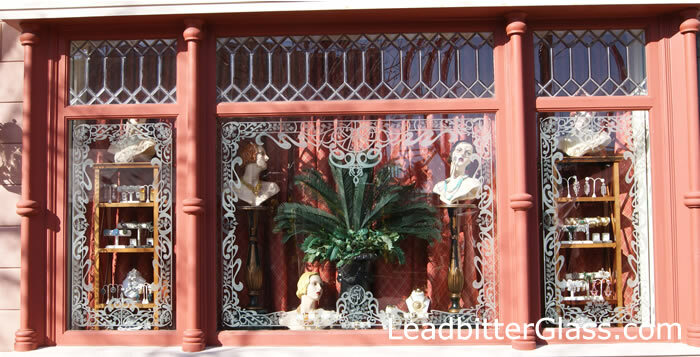 This Victorian style window design is featured as part of Universal Studios New York streets area at the Orlando theme park in Florida. 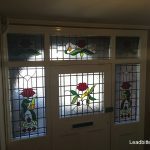 This style of design is an ideal way of decorating large traditional style windows without blocking out any of the natural light and also still allowing a clear view through the window. 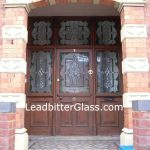 Leadbitter Glass can create this type of design or we can create a custom made design especially tailored to your specific tastes. 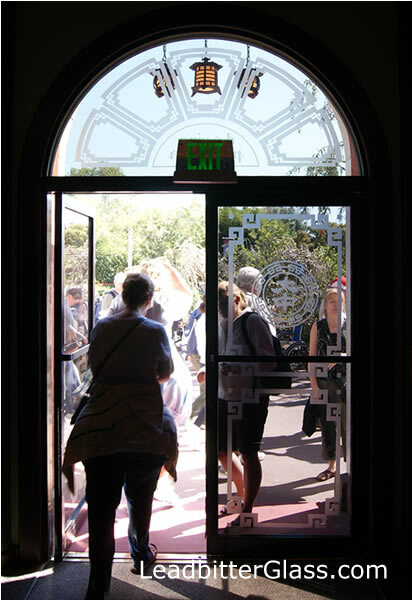 These etched glass doors were photographed at the Hard Rock Hotel in Orlando Florida during a recent holiday. 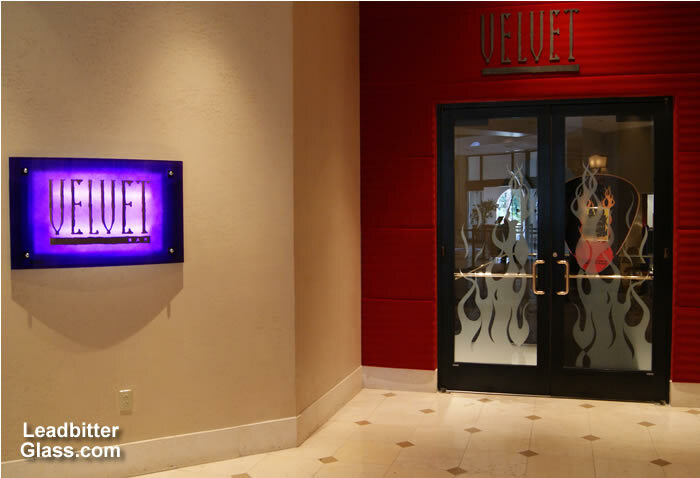 The doors are the entrance to the Velvet bar in the hotel and this basic but effective design is ideal for restaurants or other commercial buildings. 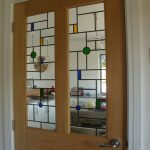 We can create similar door designs using your exact glass sizes. This deep sandblasted logo is carved into this large piece of glass and is used as a sign at the entrance to the Busch Gardens theme park in Tampa Florida. 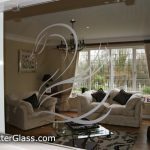 We can create logos and company names using our sandblasted glass technique for external use or internal use.